The College of Liberal Arts and Sciences (LAS) is a diverse community of scholars and students who are actively engaged in acquiring and communicating knowledge across a broad spectrum of disciplines. We offer an excellent research-rich undergraduate and graduate education that prepares students to become engaged citizens in a world of multiple cultures, languages, and possibilities. Across all of our programs, students are given learning opportunities that incorporate the sciences, social sciences, and humanities. We offer more than just career preparation. We provide the knowledge, skills, and scholarly foundation necessary for long-term personal and professional success. We aspire to achieve a level of national and international recognition with our faculty’s strong dedication to ensuring access for students and maintaining excellence in scholarship. We believe that a liberal arts education serves as a foundation for life-long learning and provides a gateway to the pursuit of flexible career opportunities. We place the utmost value on INSPIRING our students to love learning for its own sake and remain part of an extended network of alumni; RESEARCHING the most challenging questions of our time and extending the frontier of knowledge; STIMULATING curiosity and collaboration across the natural sciences, social sciences, and humanities; and, ENGAGING the intellectual life of the College with the concerns of the people and institutions of our city, state, country, and world communities. 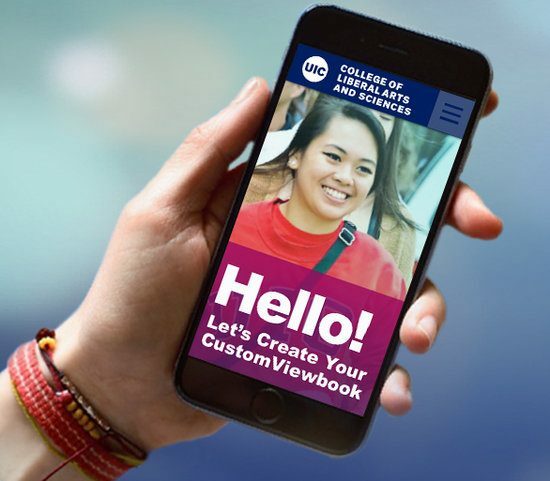 Discover LAS - Create Your Very Own CustomViewbook! Explore all that LAS has to offer by creating your own personalized digital viewbook! Simply choose your preferred academic and student life interests and gain instant access to a customized view of the College! UIC is recognized as No. 7 on the list of ‘Best Values’ universities – just behind Harvard and a few spots ahead of Stanford – in the latest rankings by the Wall Street Journal and Times Higher Education. For the first time, the rankings have further analyzed the top 250 universities to create a "Best Values" list, which considers overall ranking, tuition, fees, housing, and federal and institutional aid. UIC also ranked number 29 among more than 400 U.S. public universities, according to the 2019 ranking. UIC was recently ranked in the “Top 10 Low-Profile, High-Value Colleges” by Forbes Magazine. UIC moved up in the annual “Best Colleges” rankings published by US World News & Report —rising 16 spots to 129 among all national universities. We are also in the top 15 ethnically diverse national universities. Money magazine ranks UIC within the top 100 colleges that are a great investment for your money (rankings considered educational quality, affordability, and alumni success). Our students have access to unparalleled educational, cultural, and professional opportunities in Chicago and the world: 42% percent of UIC undergraduates pay no tuition to attend UIC and 98% of LAS students were accepted to programs at other universities and chose to come to UIC. 82% of UIC students receive need- or merit-based grants and scholarships. 52% of undergraduates receive Pell grants. UIC is in its fourth year of frozen in-state tuition. UIC and LAS embrace diversity in our faculty, students, and staff, as well as the subjects we teach and the work we pioneer. We have no racial or ethnic majority. LAS is made up of individuals who bring different backgrounds, perspectives and life experiences with them, and our most profound accomplishments result from conversation and collaboration among these many viewpoints. The College is thus committed to doing all that it can to maintain and support meaningful diversity, and to take full advantage of this diversity by ensuring inclusion and promoting the flourishing of all members of the LAS community. This attitude and the actions it implies are part of the fabric of daily life in LAS, and are expressed in a wide range of its programs and activities. UIC received its third consecutive Higher Education Excellence in Diversity award from INSIGHT Into Diversity Magazine, the oldest and largest diversity-focused publication in higher education that recognizes U.S. colleges and universities with an outstanding commitment to diversity and inclusion. UIC has received the designation of Hispanic- Serving Institution, or HIS, by the U.S. Department of Education, and is also an Asian American and Native American Pacific Islander-Serving Institution (AANAPSI). UIC is one of only four Carnegie designated Research I Institutions in Illinois. There are currently only 115 Carnegie R1 universities in the United States, and UIC is one of the very few R1 minority-serving institutions in the nation. UIC now serves 31,683 students, breaking last year’s record of 30,523! LAS has also seen its largest first-year class in at least thirty years. LAS faculty include: Fulbright Fellows, Guggenheim Fellows, a MacArthur Fellow, National Endowment for the Humanities (NEH) and National Endowment for the Arts (NEA) awardees, National Science Foundation (NSF) winners, Humboldt Fellows, Alfred P. Sloan Fellows, American Council for Learned Society fellow, and National Book Prize and PEN/Faulkner Award finalists. LAS is home to 11 endowed chairs as well as 11 active NSF Career awardees. $120M was granted as a Department of Energy investment to support an Argonne National Laboratory JCSER battery hub of collaborating scientists and institutions led by LAS’ Physics Professor George Crabtree. $2.5M was awarded to the LAS Math, Statistics and Computer Science department through a prestigious NSF Research and Training Group Grant. A $1.1M John Templeton Foundation grant was granted for research on the philosophy of space, time and quantum gravity led by LAS’ Philosophy Professor Nick Huggett. Pulitzer Prize finalist and LAS English Professor Luis Urrea’s latest book House of Broken Angels has earned him the title of “one of our most important American public intellectuals” as reported by the Chicago Tribune. LAS Chemistry Professors Cho and newly recruited Professor Zhou are the only recipients of a prestigious National Institutes of Health R35 Maximizing Individuals' Research Award (MIRA) on campus. Aixa Alfonso, a professor in Biological Sciences, is the principal investigator of a $5.2M Department of Education grant that is awarded to Hispanic Serving Institutions to increase enrollment and graduation rates of Hispanic and low-income students in STEM degrees. UIC is one of only four Carnegie designated Research I (R1) institutions in Illinois. R1 is the highest rating for a research institution from the Carnegie Classification of Institutions of Higher Education, the gold standard for standard for assessment. At UIC LAS, undergraduate students have the unique opportunity to conduct original research under faculty mentorship through the LAS Undergraduate Research Initiative (LASURI). Projects range from studying the psychology of poverty to examining the thermal evolution of the moon. $100M+ in external research funding has been generated by LAS's Learning Science Research Institute (LSRI) faculty members to support research on learning and teaching, particularly in the Chicago Public Schools. Royalties from the HIV/AIDS drug (Prezista) have brought in over $24 million to LAS making it (to date) the most successful royalty producing patent ever developed by University of Illinois faculty. A portion of these funds is endowing four faculty chairs in the sciences. Not only is Prezista an important treatment option for patients with drug-resistant HIV, but it was made available to the world’s least developed nations at a price far lower than the U.S.’s commercial price. LAS has received nearly $1.9M in grant funding from the Andrew W. Mellon Foundation. $1M will create opportunities for four successive cohorts of 80 first-year students to take part in engaging humanities courses, workshops, and lectures each year, leading to a major research project and career or graduate preparation in their junior and senior years of study. LAS is the recipient of a $1M Howard Hughes Medical Institute Inclusive Excellence (HHMI) grant to grow a professional learning community of STEM educators.